It’s a 360 world and we’re living in it — making 360/VR post & VFX workflows easier. We were super excited to bring Mocha VR to the mecca that is NAB. It was inspiring meeting all you 360 filmmakers, artists, and general movers & shakers in this burgeoning (and fun!) industry. The icing on the cake? 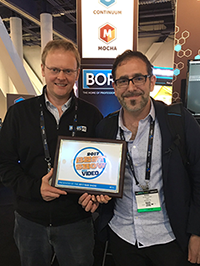 Taking home the NewBay Best of Show Award from Digital Video and being named a Post Magazine’s 2017 Post Pick. 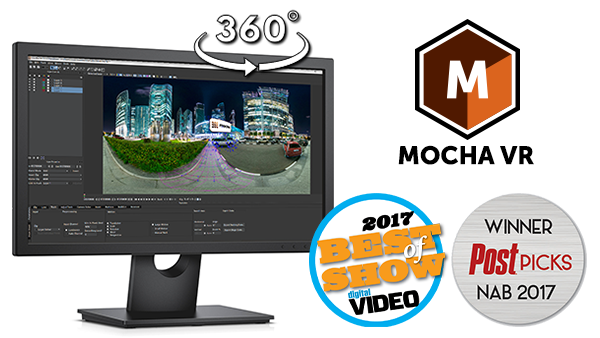 Mocha VR’s groundbreaking plug-in brings native 360° optimized tools to Adobe Premiere Pro CC, Adobe After Effects CC, Avid Media Composer, The Foundry’s NUKE, and Blackmagic Design Fusion. Features include: motion tracking, masking, object removal, and horizon stabilization.